My name is June Miller. 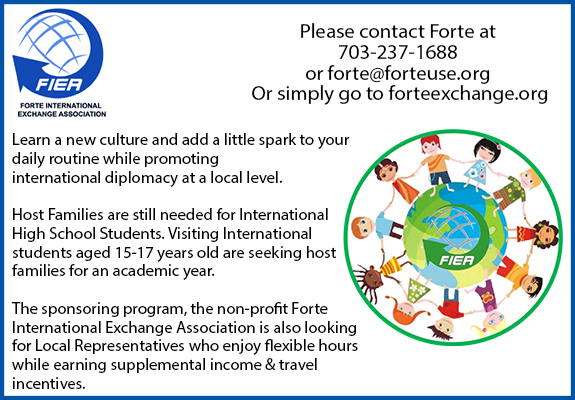 I am the development director for Forte High School Exchange Program. Forte is a small agency with good quality control and a personal touch. This is the most meaningful, fun, life-changing, world impacting job you will have EVER have......or dreamed of. This is a part time (90% at home) if interested in the job please let me know. My students impact me and my family just as much as my family impacts them. You do not have to host a student to become a representative (although I'm sure you will want to eventually). You get to work with families in your area and community. is some information on being a local Representative for Forte. You can check our website. Please let me know if you would like to talk more or would like an application. Together we ARE changing the world!! !